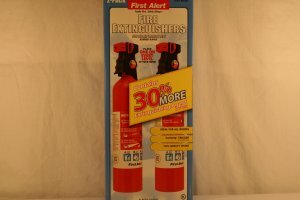 You don't need an emergency to need a fire extinguisher. If you are lucky, you will get a fire extinguisher and all it will ever have to do is collect dust. If you do need one, however, they can save your property or even your life. Dry Chemical: extinguishing agent and non-volatile propellant. Halon: gas which chemically interrupts the burning process. Water: standard water, best used on ordinary combustible fires. Carbon Dioxide: best for liquid and electrical fires. Class A Extinguishers are designed to put out Class A fires, i.e. wood or paper fires which are the most common types of fire. The numerical rating relates to the amount of water the extinguisher contains and the quantity of fire it will put out. Class B Extinguishers operate on class B fires, which are combustible fuel fires, hydrocarbons or burning solvents. Water is not used to put out these fires because the fuel is lighter than water, and water would spread it rather than put it out. Class B extinguishers usually contain some kind of protein-based foam. Class C Extinguishers are for electrical fires. When the electricity is cut off, the fire either goes out or is considered a standard Class A fire. A class C extinguisher contains an extinguishing agent which does not conduct electricity. Class D Extinguishers are designed for burning metal. Flammable metals include titanium, magnesium, potassium, uranium, lithium, plutonium and calcium, among others. Water is not used on metal fires; it only makes the fires worse. There is also a type of fire called a Class K fire, which is cooking oil. *Note On your extinguisher, please note if you see a line drawn thru a particular class, it means do NOT use that extinguisher on that type of fire. Of course, if you get the gas-powered water pump, it can certainly be useful in the case of a house fire, especially if you have a swimming pool. Two Fire Extinguishers, Both Rated Class "A", "B", and "C"